Majestic Luggage Tag luggage Handle Wrap Combo. 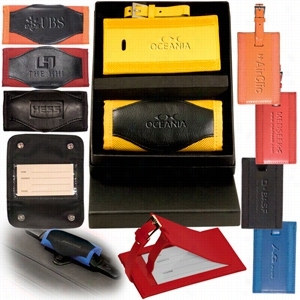 Combines the Majestic Luggage Spotter with the Majestic Leather Luggage Tag. 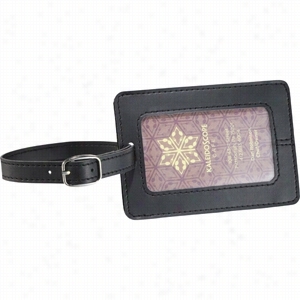 Luggage tag made from cowhide leather with ballistic nylon accents and features leather strap with silver-tone buckle which secures back panel to conceal your personal information. Luggage spotter is made from 1680D nylon with leather accents and snaps around luggage handles. Features PVC Pouch with ID card inside. Bright Vinyl Spot Luggage Tag. 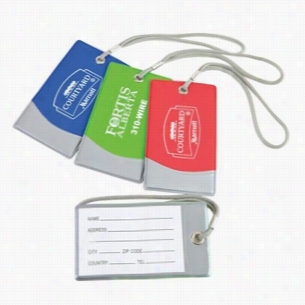 Luggage tags make great promotional items with your company's logo imprinted on them and the Promotional Bright Spot Luggage Tag is no exception. These bright vinyl color tags are accented with silver trim making it easy to spot your bags on the luggage claim carousel. They have a woven nylon cord loop and a metal grommet for added security. Place your business card in the slip-in pocket to serve as your contact information. Give these tags to employees that travel a lot, whether it's for business or pleasure. 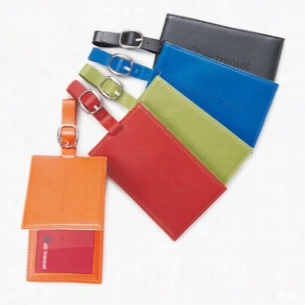 Use these luggage tags as a way to promote your company at trade shows, expos, and business conventions. These tags would be good for labeling the Kids' camp bags. They come in lime, red, royal blue, and in an assortment of colors. There are three imprint colors designed to go with the tags. Flying is stressful enough without having the trouble of finding your bags after the long flight. These bright colored tags will have you smiling when you spot your bag. 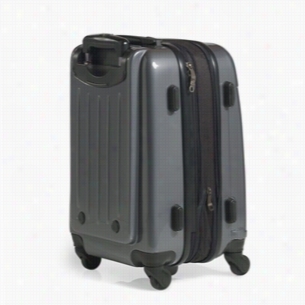 Expandable hardsided Luggage with 360 degree wheels that make going through the airport a breeze. Durable exterior protects all your belongings against the elements and airport baggage conveyer belts. Interior straps and zippered compartment hold everything in place and the lightweight design make it easy to get around. Included TSA lock makes sure your luggage is secure while traveling. Includes Luxe signature lining and hardware. Material: ABS Plastic. Manufactured By Leeds. 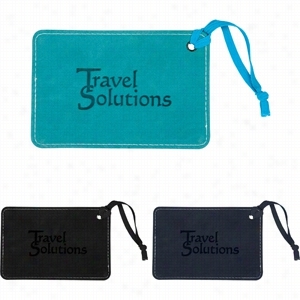 Custom Colorplay Leather Luggage Tag - 4 1/2" x 2 7/16. Brookstone Dash II 20" Upright Wheeled Luggage - Graphite. 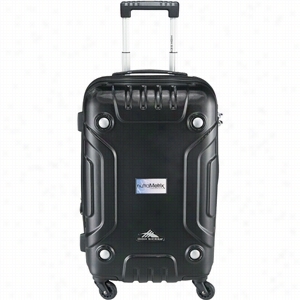 Expandable hardcase Luggage with 360Ã‚Â° wheels that follow your every turn.4 multi-directional wheels spin, pivot and scoot to keep pace with quick changes and sudden stops.Super-tough, hard side construction protects your belongings while expanding to make room for more when you need it.Ultra-lightÃ¢â‚¬â€�weighs less than 8 lbs.Interior straps and a zippered panel keep everything in place.Easy-grip telescoping handle plus top and side handles.Meets most U.S. airline carry-on requirements.Fabric/Material: ABS Plastic/Polycarbonate. Alpha Luggage Tag & Passport Wallet Set. Includes the Alphaâ„¢ Passport Holder and the Alphaâ„¢ Luggage Tag. 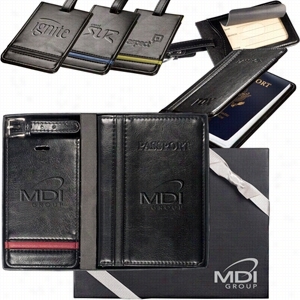 Passport wallet is made from glazed faux leather with contrasting textured accents and features internal business card pocket, document pocket, mesh pocket and elastic Pen loop. Luggage tag is made from glazed faux leather with contrasting textured accents and features adjustable strap with zinc alloy buckle. Luggage tag holds ID/business card behind acetate viewing window on back panel hidden by leather flap. High Sierra RS Series 21.5" Hard-sided Luggage. 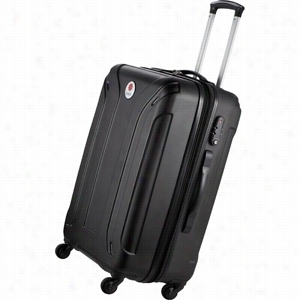 Expandable hard sided Luggage with 360-degree wheels that make going through the airport a breeze. Durable exterior protects all your belongings against the elements and airport baggage conveyer belts. Interior straps and zippered compartment hold everything in place and the lightweight design make it easy to get around. Signature High SierraÂ® branded elements. Material: Polycarbonate. Manufactured By Leeds. High Sierra Digital Luggage Scale. The choice of flight crews and frequent travelers, this digital Luggage scale measures in pounds and kilograms. Accurate up to a maximum of 110 lbs or 50 kg the quick access hook easily slides through any luggage handle and safely secures your luggage to be weighed. 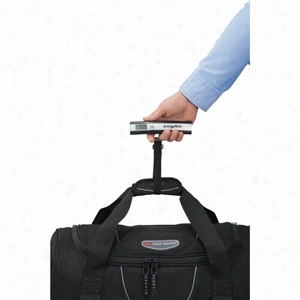 The contoured handle makes it easier to lift your luggage. Manufactured By Leeds. Identify your Luggage with the Revello Collection Luggage Tag that holds a standard business card and clearly displays your personal information for quickly picking up your luggage. The stretchable elastic strap secures your luggage tag to your luggage. Material: Italian UltraHyde. Manufactured By Leeds.